We decided to take a week long “vacation” to Bordeaux before we begin our last push of travelling. We are planning to use this downtime to plan our month long adventure in the UK and also to start planning for when we return home. Updating resumes. Dusting off references. Researching living spaces. And all the other details needed to integrate back into our former lives. We think that we will be different. We hope that we will be different. There are so many things that we have learned about the world and of course, ourselves, that it would be a shame to just jump right back into the same rut that we were in. It’s almost like graduating from high school again with amazing opportunities promised ahead – except of course, we are pretty old. So, what are we going to do? Where are we going to live? Let’s hope that we come up with some really cool ideas and plans. And of course, we are open to suggestions and job offers. Have a great week all. We’ll see you in Paris!! The view from our balcony in Bordeaux. Wine capital of France. Our tour of the Canadian war memorials has come to an end. We have seen so much, experienced feelings and emotions that are difficult to explain. Shed a few tears, had a few laughs and said Thank You many times internally and externally as we walked among the tombstones of those young Canadians. There were other sites that we did not visit, but we feel very content with what we have seen and are so pleased that you have allowed us to share our journey with you. Thank you. As in the past I wanted to make a slideshow to wrap up this part of our adventure and as I started to think about I was wondering what music I would use to accompany the pictures. Well, I can tell you that the music came to me almost instantly and it seemed very appropriate. I hope you enjoy it…. On Sunday we left the safety and security of our B&B for a leisurely walk to the Caen Memorial. The memorial is home to the Caen museum which many regard as the finest WWII museum in France and it is also home to the Canadian, American and British honour gardens. Also on site is the genuine command post bunker that the Germans used for coordinating their defence of Normandy. We did not visit many tourist places while in Caen as we used it as our base camp for visiting the memorial sites in Normandy. No Day Will Ever Erase You From The Memory Of Time. The American garden has a memorial wall with plaques from all 50 states along with messages from some American territories. Among them we found one which we thought to be unique. It was from the State of Pennsylvania and has a piece of Granite from the Gettysburg Battlefield. The bunker for the German command post was a very interesting visit. Unfortunately the lighting in the bunker was not very good for pictures. Today we travelled from Caen to Juno Beach, about a 20 minute drive. On the way we stopped at Beny-sur-Mer Canadian War Cemetery. Many of those buried here were men of the 3rd Canadian Division who died either on June 6, 1944 (D-Day) or during the early days of the advance towards Caen. There are 2048 gravesites here with the majority of them being Canadian. The site honors the dead with lovely flowers, well kept lawns and hedges and a view that faces Juno Beach. Once at Juno Beach we walked along the boardwalk and crossed over the dunes to the beach. There are a number of storyboards along the way telling the story of the first offensive of the Allieds on this day of days. Buried in the sand is a German bunker which gives you an idea of how close the enemy really was to the beach. Even though many young men perished that day, it is amazing to me that any of them actually made it up out of the water onto the beach without being completely slaughtered. Their courage is amazing!! Situated immediately behind the beach is the Juno Beach Centre. This museum, established in 2003, gives a history of Canada before the Second World War, our contributions during the war – both in Europe and at home, our current role as peacekeepers around the world and finishes off with a very moving twelve minute film of the landing and subsequent fighting on D-Day and the days that followed. Richard and I spent at least three hours here and would recommend it to anyone – especially if you are a Canadian. It is emotional at times, very well organized and always informative. We left the museum feeling that we have probably seen all that we can see at this time. Our minds are flooded with facts, our emotions are ragged, and yet our cup runneth over. We are so blessed to be Canadians and are so proud of those that have gone before us. There is nothing more to say. The Canadian Flag greets you as you drive into the parking lot of Beny-sur-Mer. The arrow on picture below this one shows where the German soldier was positioned at the top of the bunker. Orders given to the Canadians as they landed at Juno Beach. Col looking over the Memorial Bricks. The five soldiers of the Remembrance and Renewal sculpture stand tightly in a circular formation, each looking outward in the distance. The massive figures undulate into one another, accentuating the unity and comradeship of those who served Canada at home and abroad. This memorial sculpture honours the sacrifices of all those who participated in the war effort, both in the field and in all operations in Canada, to help bring about the final victory. As you know from the blog we paid a visit to Vimy Ridge which is the largest of the Canadian WWI memorials. Being as we were there just a few days ago Matthew Halton’s report connected with us in a profound way. We packed up and headed out to Vimy Ridge, Beaumont-Hamel and Dieppe. We figured we would spend about an hour at each and be at our BNB in Caen by 6 PM. Boy, were we wrong! The Vimy Ridge Memorial stands high above the Douai Plain in Northern France and is a tribute to all the Canadian soldiers who lost their lives in World War I. We parked the car and headed straight to it. It is absolutely magnificent. It took 11 years to build, stands 110 meters from base to tip and has 11,285 names of Canadian soldiers inscribed inside the ramparts. It was unveiled to the public in 1936. What we didn’t know was that the monument sits upon 123 hectares of land that was gifted to Canada from France in 1922. Upon this land are trails that follow the battlefield, craters created from artillery fire and underground mine explosives, trenches and tunnels used by the soldiers, two Canadian cemeteries, No Man’s Land and of course the monument. What kind of explorers would we be if we did not check all these things out? We walked to the Visitor’s Centre which is loaded with pictures, facts and artifacts of the battles on Vimy Ridge. We picked up a self-guided tour map and spent the next hour or so, wandering through trenches, looking over No Man’s Land, checking out the gravesites and being totally blown away by the absolute immensity of it all. We came away humbled and about two hours behind schedule. Our next stop was the Beaumont-Hamel Newfoundland Memorial, just a few miles further down the road. We had been prepped by one of the Canadian student guides at Vimy that we could expect much the same type of memorial. The memorial site is located on 30 hectares of land with the centrepiece being the Caribou Monument. The site is a tribute to the 820 Newfoundland soldiers who died during the first World War. The Tourist Centre houses facts, artifacts and storyboards detailing the heroics of the Newfoundland regiments that fought at various sites during the war. The self guided tour pamphlet is one of the best that we have seen, with the current tour trail superimposed over the original trenches and tunnels from over 100 years ago. The site itself is much more “raw” than the refurbished version at Vimy. Original trenches still exist as they did then, clearly visible throughout the entire site. As you walk along the guided trail, the pamphlet describes each numbered station giving you a very realistic overview of how things unfolded during the battles. The Caribou Monument itself is magnificent! It sits high upon the battlefield overlooking the valley below. The noble bronze caribou is the emblem of the Royal Newfoundland Regiment and sits atop a mound surrounded by rock and shrubs native to Newfoundland. It is designed so that you can walk up and around the spiral footpath to the top of the monument. So very well done. We enjoyed this site immensely and definitely recommend a visit. As we still had a three hour drive ahead of us, we decided to leave Dieppe for another day. We drove through so many cute little villages and passed by so many cemeteries. The beauty is breathtaking but the history is just so horrific. We reached our BNB just before 7 PM and by the time we settled, got some groceries and had a bite to eat, we were pretty much done for the day. Another emotional day viewing these magnificent memorials. Just as a side note, I have to mention the Canadian student tour guides. These students are employed by Canadian Veterans Affairs and travel overseas to guide these sites for a four month tenure. The only qualifications that one needs is to be a post secondary student and to speak French. We spoke to a few of these “kids” and we found them to be very enthusiastic about this posting. So, if you have kids or grandkids that are looking for some adventure, this is an amazing program to get involved in. Also, while we tramped around France and Belgium looking at battlefields and cemeteries, Richard’s youngest daughter Hilary gave birth to a beautiful daughter on April 10. We are so proud and can’t wait to get home to see the newest additions to our family. Congratulations Hilary, Dane and Norah! We love you!! The Beavers at the base of the flag poles. A view from the monument. With the amount of undetonated artillery they use sheep to keep the grass down. Just in the small area of France we were in today there are 410 Commonwealth cemeteries, 20 French and 13 German. We passed close to some and others we saw in the distance. Out in the middle of nowhere we decided to stop at one. Monument to the Highlanders who played a crucial role in the Beaumont-Hamel campaign. Col walking one of the many trenches. This one is about two feet higher than it would have been at the time of the war. After our long, emotional day yesterday, we thought that we would take it a little easier today. We decided to head for the coast and check out Calais and Dunkirk. It was a nice hour and half drive through the beautiful French countryside. We got excited to see the exit for the chunnel to England and thought that maybe we would just pop over and back just for fun. However, after looking into it a bit, we decided that it was probably pretty silly and quite expensive. So, we continued on a couple of miles past Calais to Saint-Inglevert. The Calais Canadian War Cemetery contains 704 Commonwealth burials of the Second World War, 30 of them unidentified. There are also seven Czech and 19 Polish war graves. It was humbling seeing so many Maple Leafs on the tombstones – many from the Royal Winnipeg Rifles. The men were so young, some only 19 and 20. It seems such a waste. We wandered around there for about a half hour and then made our way back towards Dunkirk. We parked near the pier and walked along the wide expanse of beach. Though the day was windy and fairly chilly, it was great to be near the water again. We watched the waves roll in from the English Channel as the wind played havoc with the sand and sea. We walked to the end of the beach and after skirting around some construction found the memorial from Operation Dynamo. With a combination of hard fighting and German indecision, the port of Dunkirk was kept open allowing 338,000 Allied troops to be evacuated. If you haven’t already, a must see is the movie Dunkirk which portrays this 1940 operation. We considered the day complete and headed back to the car and our temporary home in Lille. Tomorrow we pack up again and drive down to Caen, stopping along the way at Vimy Ridge, The Beaumont – Hamel Newfoundland Memorial and Dieppe. Another emotional day I am sure. The Calais Canadian War Cemetery. As Col had mentioned there were a lot of Royal Winnipeg Rifle inscriptions on the grave stones which made us feel very connected. On the lighter side here is Col posing by the Old Fashioned change rooms on the Dunkirk beach. Our Toyota Hybrid which has been getting us around to the memorial sites. A big shout out to my wife who has been doing all the driving and has already taken me to some memorials I had not even thought of. Good job honey!!! Today we picked up our car rental in Lille, France and headed back in to Belgium to see some World War I Canadian Memorial sites in and around the town of Ypres (now called Ieper). Flanders Fields is the name given to the battlegrounds located around this area. We basically did a loop around a number of battlefields and Canadian memorials, stopping at each one to take pictures, read the story boards and contemplate the lives of the men that faced the horror of war every day. We made our way to Hill 62 and Sanctuary Wood (a memorial commemorating the actions of the Canadian Corps in defending the southern stretches of the Ypres Salient between April and August 1916), Tyne Cot Cemetery (the largest Commonwealth cemetery in the world), Passchendaele (where Canadian soldiers fought in the mud for months to regain the town), St. Julien and the Brooding Soldier, Essex Farm Cemetery (where Canadian John McCrae wrote the poem “In Flanders Fields” and then on to Ypres where we finished off the day with “The Last Post”. Every day since 1927 and the opening of the Menin Memorial Gate into Ypres, this moving tribute to all the fallen soldiers is given at 8 PM. Every day the road is closed and people gather from all around the world to pay their respects and listen as the haunting sound of “The Last Post” is played. Every day people weep for family members that they never knew and every day we are blessed that these people made the sacrifices that they did. It was an emotional day but we also could not stop admiring the beauty of this part of the world. The houses are quaint. The farms are neat and tidy. The landscape is so green with horses and cattle everywhere. So peaceful. From the top of the steps leading up to the Hill 62 (Sanctuary Wood) Canadian Memorial, looking down past Sanctuary Wood and Maple Copse along the broad spur of Observatory Ridge, you can see the church towers of Ypres, five kilometres to the west. A great many of the Canadian headstones in the Maple Copse and Hooge Crater Cemeteries nearby bear a date in June 1916. Colleen signing the guest registry. We signed as many as were available. The Tyne Cot Cemetery is now the resting-place of nearly 12,000 soldiers of the Commonwealth Forces, the largest number of burials of any Commonwealth cemetery of either world war. It first came into being in October 1917 when one of the captured pillboxes was used as an Advanced Dressing Station, resulting in some 350 burials between then and the end of March 1918. The cemetery was much enlarged after the Armistice by more than 11,500 graves from the battlefields of Passchendaele and Langemarck and from a few small burial grounds. The dates of death cover the four years from October 1914 to September 1918 inclusive. Unnamed graves in the cemetery number nearly 8,400, or 70% of the total, and the names of the unidentified soldiers who lie in them are inscribed on the Menin Gate in Ypres and on the panels of the Memorial which stands to the rear of this cemetery. The site of the Memorial is on the high ground of the western slopes of the Passchendaele Ridge. It is in the middle of an agricultural district, with widely scattered farms and small villages. It represents the most desperate offensive fighting and stubborn resistance of the Commonwealth Armies in Belgium. It is the farthest point in Belgium reached by Commonwealth arms in the First World War until the final advance to victory. As we traveled through the Flanders area today we experienced some of the most beautiful land we have seen for a while. It stands in stark contrast to the devastation that took place all around it. We stopped for lunch in a town called Zonnebeke which is near Passchendaele and these young people came marching by dressed in WW1 fatigues. THE CANADIAN CORPS IN OCT.- NOV. 1917 ADVANCED ACROSS THIS VALLEY – THEN A TREACHEROUS MORASS – CAPTURED AND HELD THE PASSCHENDAELE RIDGE. When Passchendaele was rebuilt, a new road was constructed that ran straight from the the center of the town to the Canadian memorial site. The road is called Canada Lane. What the town of Passchendaele looked like after the war. Like many towns in the area it was completely destroyed. St. Julien Memorial and the Brooding Soldier. Visible for several miles from its site beside the main road from Ypres to Bruges, the impressive Canadian Memorial at St. Julien stands like a sentinel over those who died during the heroic stand of Canadians during the first gas attacks of the First World War. It is one of the most striking of all the battlefield memorials on the Western Front. Rising almost 11 metres from a stone-flagged court, “The Brooding Soldier” surmounts a single shaft of granite – the bowed head and shoulders of a Canadian soldier with folded hands resting on arms reversed. The expression on the face beneath the steel helmet is resolute yet sympathetic, as though its owner meditates on the battle in which his comrades displayed such great valour. The statue is set in the middle of a garden surrounded by tall cedars, which are kept trimmed to perfect cones to match and complement the towering granite shaft. There are 1,200 WWI servicemen buried or commemorated in this cemetery. Of these burials 103 are not identified. There are special memorials commemorating 19 casualties who are known or believed to be buried among the unidentified burials. The cemetery was used by several British divisions holding this sector from 1915 to August 1917. Men from these divisions are buried throughout the cemetery. Plot I contains the dead of the 49th (West Riding) Division from 1915. The dead of the 38th (Welsh) Division dated in the autumn of 1916 are buried in Plot III. Bunkers that still remain at Essex Farm. The bunkers of Essex Farm ran along the canal. Across the canal, German combatants huddled in their bunkers as the two sides fired at each other. Essex Farm Cemetery is probably one of the most visited sites in the Salient, and this is principally because of its association with John McCrae. John McCrae was a Canadian, born in Ontario in 1871, who qualified in medicine at Toronto in 1898. He served with the Artillery during the Boer War. From 1901 until 1914, he practiced as a doctor in Canada and in England. On the outbreak of the First World War, he enlisted within the first few weeks and was sent overseas in September 1914, again with the Canadian Field Artillery. While stationed at Essex Farm, in May 1915 he wrote the famous poem “In Flanders Fields“, after one of his friends, Alexis Helmer, was killed and buried. Below is a memorial to John McCrae. 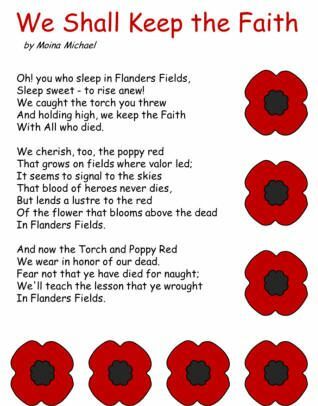 Seeing the poppies blow around the graves led to the best known image of this poem. “In Flanders Fields” was published for the first time in Punch in December that year, and has since come to encapsulate the sacrifice of those who fought. 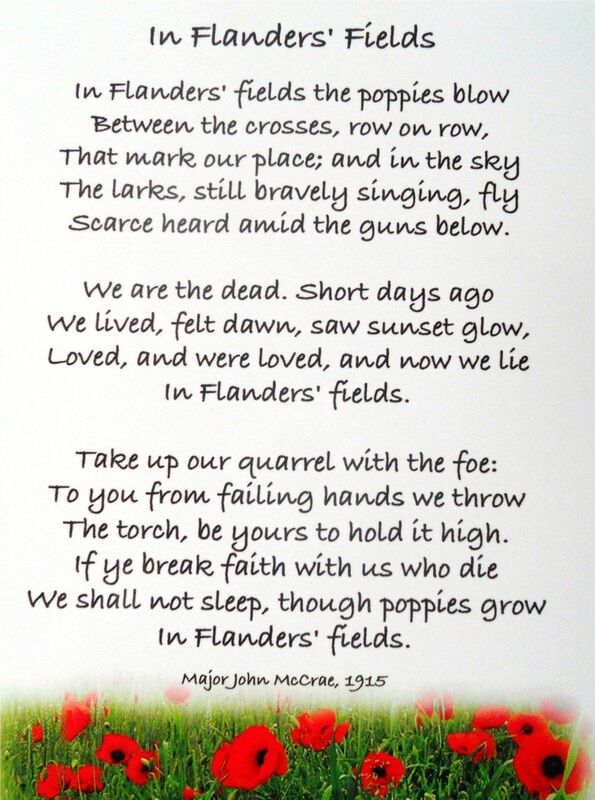 Colleen and I have both read this poem many times, but when you are reading it in the exact location it was written and standing among the many graves of fallen young men it hits you in a way that is difficult to explain. This last picture was taken while standing on one side of the fence of the Essex Cemetery. So peaceful and again such a contrast to what we were experiencing that day. Ypres (Ieper) and the Menin Gate. The names of the Canadian Soldiers who perished defending Ypres. The Start of the Ceremony. The young people in red below were part of the choir that took part in the ceremony. On this occasion it was sponsored by a local school. The end of the Ceremony. On a personal note, today was probably the most emotional day I have had so far while on our journey. The memorials are kept in impeccable shape. They are just beautiful. So Proud to be a Canadian today. Sunday was travel day and we sadly said goodbye to the cute little town of Baarn and hopped on the train for Brussels, Belgium. The two and half hour train ride turned into three and a half as we sat on the tracks for about an hour with a mechanical breakdown. It gave us time to reflect on what we had seen in Holland and we wished that we had booked more time there. Everything is so clean and tidy, with street sweepers going by every half hour or so in Amsterdam. The tulips are starting to bloom, hedges are trimmed and out in the countryside, horses are frolicking in the new green grass. It’s all as pretty as a picture and we are so fortunate that we were able to experience it. We arrived in Brussels about 7:30 PM and after stopping in at the BNB, and having a pleasant conversation with our hostess as she was finishing up changing the bedding, we headed out for a bite to eat. We found a wonderful Italian place that made everything fresh and it was delicious!! Back at our apartment we couldn’t help but notice that it was not very clean and in fact had spoiled food in the fridge and fruit flies and regular flies everywhere. We debated about leaving and going to a hotel but in the end we sucked it up, bought some Raid and paper towels, did some cleaning and decided that we wouldn’t be spending much time here. Considering all the BNB’s that we have been to in the last 9 months, this is only the second one that has given us the heebie-jeebies. That’s not so bad. As April 8th is Richard’s birthday, we headed out for a day on the town. We walked the forty minutes to the downtown stopping along the way for a birthday drink at a cute little cafe, having lunch at McDonald’s (Richard’s favorite made even more so because they serve beer at the McDonalds here) and just looking at the sites. The downtown is vibrant and very busy with tourists. We checked out some churches, walked past the palaces and courthouse, checked out the government house before heading back home. Richard’s birthday supper was Chinese ordered in with Uber Eats. Now that’s slick!! Just order online from anywhere in the city and Uber delivers to your door. Sweet. Today is laundry day and as it is raining we probably won’t stray too far from the apartment although we do have to go to the train station to reserve our tickets. We’ve cleaned ourselves a nice little area in the living room where we can settle in and watch some Netflix. Tomorrow we head to Lille, France where we rent a car and start following the path of Canadian war memorial sites. That should be very interesting. The Manneken Pis. Little Pee Man in Flemish. The peeing boy is a small bronze fountain statue from the 17th century that is tall just 61cm (24 inches). One would not normally call this art piece ‘majestic’, but the locals have so many stories and ways of celebrating with this little boy that even the toughest critic would find some fondness for the bronze doll. Many great legends bring this little statue to life in the hearts of visitors, and the question is why was this statue erected? One story tells of a tourist father who lost his son in the city and after receiving help from villagers to find the boy, he gifted this statue to them. Another, more daring, tale is one where the boy was a spy during a siege of the city. He literally put out a ploy to bomb the city by urinating on the explosives! Many stories such as this have given the Manneken Pis a firm place in Brussels’ city-life but none would compete with its present-day glory. To give peeing boy a playmate, another statue was built called Jeanneke Pis in the 80s. This other statue is a little girl fountain, but she is lesser known and hides in an alleyway a short distance away from Mannekin Pis. I snapped this last picture as we were finishing up our last meal in Amsterdam before catching the train to Brussels. Now I know that Amsterdam is a progressive city and the Dutch are little ahead of us on some things such as their laws on prostitution and drugs, but I thought this one might be a bit much. The Man With Two Hats. One of the things I (Richard) really wanted to do while in Western Europe was to visit as many Canadian war memorial sites as I could. First stop, Apeldoorn in the Netherlands. Apeldoorn is host to the Man with two hats. In the City of Apeldoorn, The Man With Two Hats monument symbolizes many dualities. The two hats in and of themselves represent a time when to come through the war with one hat was something of a feat. It represents the end of the horrors of war but in the same vein the peace and freedom that continue to elude many countries today. It symbolizes the two countries of Canada and the Netherlands. The outstretched arms symbolize the liberation of the Netherlands and also the reaching out of country to country, people to people. The visage, one of sadness and deep meditation and also one of serenity and peace. With the donation of this monument, the Netherlands pays a lasting tribute to Canada. A statue identical to this one stands in Ottawa, Ontario. The twin monuments symbolically link Canada and the Netherlands, forever close friends. The monument, which was sculpted by Dutch artist Henk Visch, is made of bronze and measures 4.6 metres. Entitled “The Man with Two Hats” (De man met de twee hoeden), it symbolizes the historic bonds between Canada and the Netherlands. This was just the first of a few Canadian war memorials to come. I don’t know how my emotions will be as I / we experience these, but I have to say that even today I could feel my emotions coming to the surface. I am eager to share these with you as we will be continuing our journey through Belgium and France. The translation of the plaque below reads: This tree was planted on December 29, 1945 by Lieutenant General G. G. Simonds, Commander of the Canadian army corps that liberated the Netherlands. At the time I took this picture I didn’t know what the translation was so I didn’t take a picture of the tree. Trust me, it is a beautiful tree. More of the Man With Two Hats.